Meretz activists protest outside President's Residence over Rodrigo Duterte's visit to Israel and his meeting with President Rivlin. 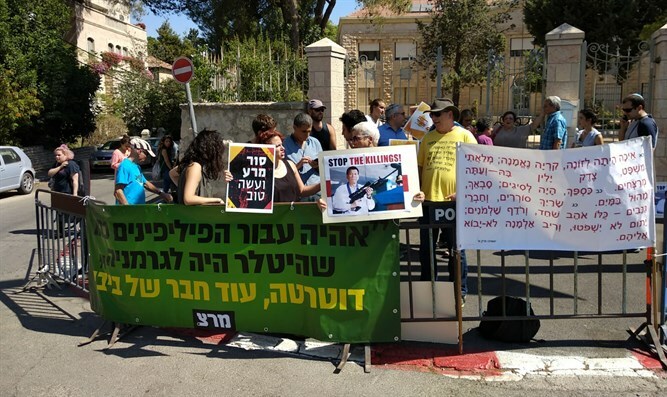 Meretz activists are demonstrating outside the President's Residence in Jerusalem on Tuesday against President Rivlin's meeting with Philippine President Rodrigo Duterte. MK Tamar Zandberg, Meretz chairman, recently turned to President Rivlin and asked him not to meet Duterte. "According to reports, Duterte's visit is expected to include a visit to weapons displays. In light of his problematic actions, to put it lightly, against civilians and innocent people, this will put Israel in a position of sharing in the crimes against humanity that Duterte carries out in his country," Zandberg wrote. "I believe that there is no room for the visit of such a person to President Reuven Rivlin's residence. We must prevent a situation in which the president's office and the honor the president gives to world leaders is being used to promote arms deals and votes in the UN," Zandberg said in her letter to Rivlin.